If you have registered a domain and now want a perfect website for blogging then wordpress is the right choice for starters(in my personal opinion). There are many paid hosting sites out there but if you want your website up and running without spending money on webhost then 000webhost is just good enough to begin with. In this post I will be telling how to setup wordpress in 000webhost server using the FTP clients like filezilla or fireftp. I will be using fireftp which is a addon for mozilla firefox. I also used filezilla but if found fireftp was good for me but you can use any ftp clients out there. 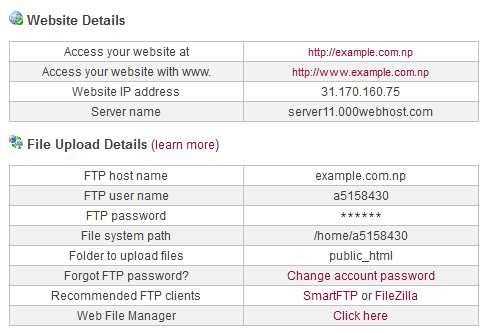 Download filezilla, if you use mozilla firefox then search for fireftp addon for your mozilla firefox browser. Download the latest version of the wordpress from http://www.wordpress.org/ and unzip. 1. 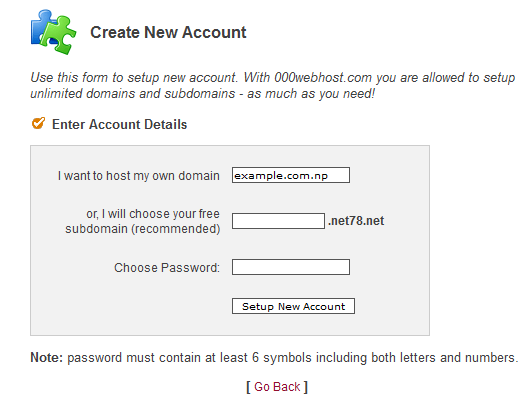 Login to your 000webhost account. 3. 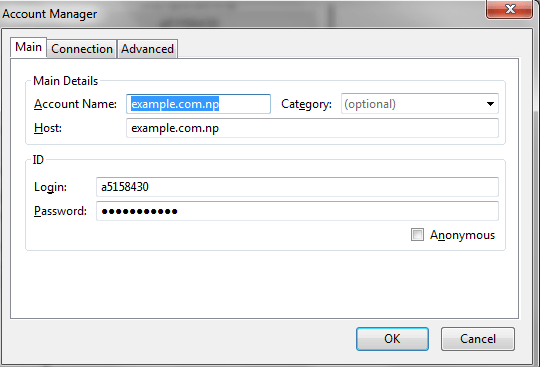 Enter your registered domain name instead of example.com.np eg. 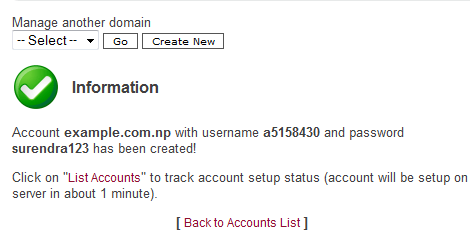 surendrashrestha.com.np and choose the password as you like and click setup new account. 4. Upon completing the above step you should get the message like this. Now click Back to accounts list. 6. Now Click view account Details. Now if you are getting the following error message then it means the domain is not pointing to the 000webhost name server. 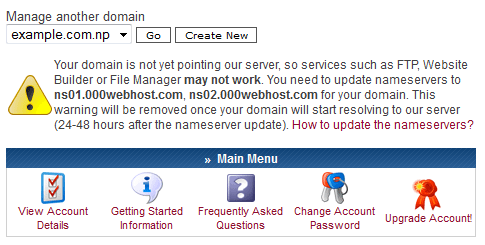 You have to point the dns(domain name system) server to the 000webhost. If you already have used the nameservers to ns01.000webhost.com and ns02.000webhost.com for your domain recently then you have to wait 24-28 hours. If it still shows the message then double check the nameserver name and type it exactly as it says, once I mistyped the domain nameservers as ns1.000webhost.com make sure you haven?t done the same mistakes. 7. Note down the ftp details the password will be the same as the password you used in the step 3. After noting down the details Click Enter the control panel. 9. Now you need to create the database for the wordpress. Fill up the form as you wish. After filling the form click create database. You will be greeted with the information as below. Now you need to note down all the information carefully. 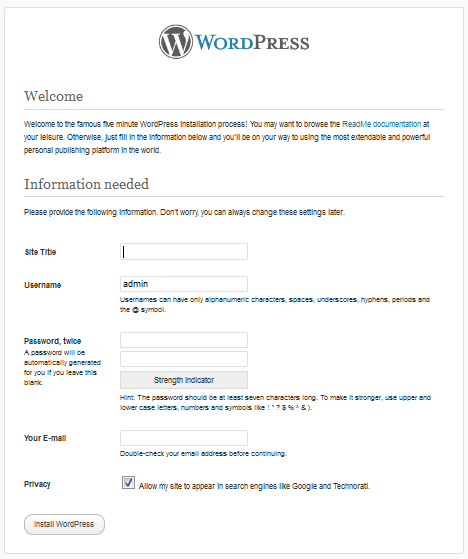 You will need this information to setup your wordpress. 10. Now locate your wordpress folder the place where you downloaded the wodpress and unzipped it. Open the wordpress folder on your computer. Open the file wp-config-sample.php in notepad. Now you only need to edit the information that are marked red. Just fill up the red words with the information you noted in step 9. Replace database_name_here with a5817322_wp (And of course you need to type your own information, the one you have noted down not the one I write here). And finally replace localhost with mysql12.000webhost.com. Double check the information you filled and save changes to the file. 11. Now open the fireftp from mozilla or open the filezilla. Filezilla user are on there own?. sorry folks, but the overall thing is just the same I guess you should easily be able to setup anyway. On firebug click create new account. Use the information from step 7.
use ftp hostname from step 7 as host. use ftp username from step 7 as login. use ftp password from step 7 as password. 12. Now connect to the FTP server using connect in the firebug. If everything goes nicely till here then you should be successful to connect and the the files on your servers should be listed on the right pane and the left pane you can browse the files on your computer which you can push it to the server. On right pane double click public_html. There will be a file named default.php. Now on the right pane navigate to the folder where you downloaded wordpress and unzipped. Select all files on the left pane and right click and select upload or use the right arrow key to push files to the server. Now the uploading the files to the server takes time depending upon the speed of your internet. Be patient and make sure you transfer all files to the server. Incomplete transfer may cause problems to your site. 13. After successfully uploading all your files to the server it time to launch your website. Type the url of your site on the browser i.e www.example.com.np. Now keep your hands crossed and hope everything goes well. If you are following everything properly then you should get what I get on the browser. 14. Now fill up the information as asked by the wordpress and click install wordpress. 15. This is the end of this post. Now login to your wordpress admin and see what you can do. I am sure you will be able to find a nice theme and start blogging. Read the tutorials and documentation provided by the wordpress. I hope this was useful. Good luck. It make my blog home http://merosofts.tk/wordpress please help to remove wordpress and make onlt http://merosofts.tk as home?????? Simply upload the site contents to your root directory not inside the folder wordpress. Check http://www.upadeshshrestha.com.np/2012/03/tutorial-how-to-porthost-np-domian-on.html if you want to post your .np domain in blogger. Using ftp client to setup wordpress takes a lot of time. I have an easy and fast tutorial for it. at first download the wordpress zip file from wordpress.org and then upload the zip file to your 000webhost.com accunt via file manger upload. it will be automatically uncompressed and then you can continue installing your wordpress. this process won’t take time as that of ftp which is time consuming as well as not so reliable process. Updesh see this this article. 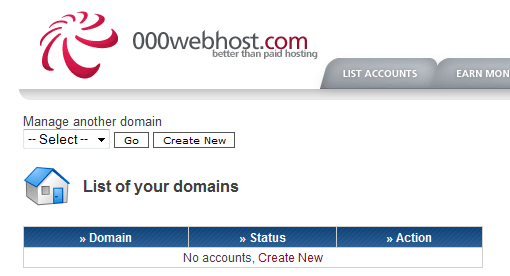 i have explained how to host .com.np domain in blogspot with all the screenshots.